Belief work is the work of changing beliefs, which alone can and will change your life. The ThetaHealing® technique allows us to access the energy of creation to change beliefs instantly. As it is our beliefs that create our reality and experiences, belief work is one of the most important things we can engage in to improve our lives. In the ThetaHealing technique, we recognize four belief levels that comprise all that we are. Core: The core level is this lifetime, all we have experienced and accepted in childhood, adolescence and into adulthood. Beliefs held at this level are highly influenced and shaped by our environment, what we were told by parents, teachers, good friends, people we trust. Core beliefs can also develop based on simple repetition from multiple sources: TV, music, common sayings (including sarcasm received as literal), billboards, ads, etc. The energy of beliefs on the core level are held in the frontal lobe of the brain, and you may notice sensation here when these beliefs change. 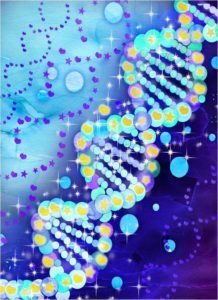 Genetic: Beliefs on the genetic level are passed down from the ancestors as energetic imprints. The beliefs of this level are held in the morphogenetic field around the DNA rather than the physical DNA. This field of information is what instructs the physicality of the DNA. Beliefs changed at this level are carried through all relatives who share this DNA, back through ancestral lines, siblings, and descendants. Your genetic level belief work gets shared! This level gets quite interesting as this is where beliefs can be found that may surprise you. A few good example are fears, prejudice, and “traditional role” beliefs. The energy of beliefs held on the genetic level can best be accessed through the master cell located in the pineal gland. History: The history level comes from just that: history. Past lives, very old ancestry, the collective conscious/unconscious, they can all carry through to the current moment on the history level. The energy of beliefs held on the history level are located in the auric field. Soul: The soul level is the deepest level, it is all that we are. Changing beliefs at the soul level can be quite easy, and can pull programs off of our complete being. The energy of soul level changes begin at the heart chakra and expand out. It is important to allow yourself to go very deep with your ThetaHealing practitioner. Often there will come a point where there is a release of emotion that indicates a root belief has been reached. It is at this point that some of the deepest, most profound healing happens. When you allow the All That Is to heal you, (the practitioner does nothing more than make the request and witness the energy movement) you begin to feel lighter, freer. You’ll notice a difference in your daily life, and that’s an adventure. To see how it shows up for you! Belief work is powerful. If you allow yourself to go deep and allow the All That Is to heal and change the issue for you, it will change your life for the better.